Making Syrup from Tunas? C’mon now! OK. Now that I’ve got your attention, just how DO you get syrup from a tuna? Easy, if the “tuna” is the fruit of the Prickly Pear Cactus! 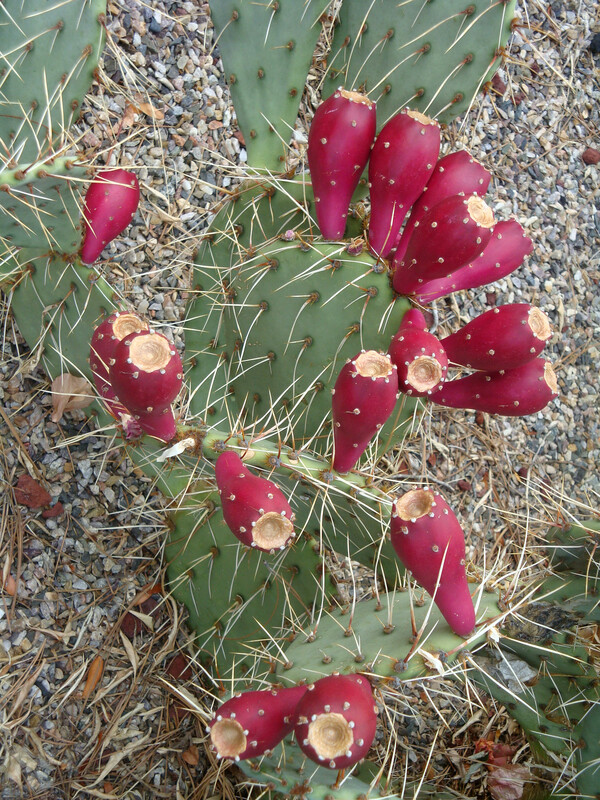 Readers of my blog may recall my post of September 1, 2014, “Life in the Desert – Prickly Pear Cactus Jelly“. 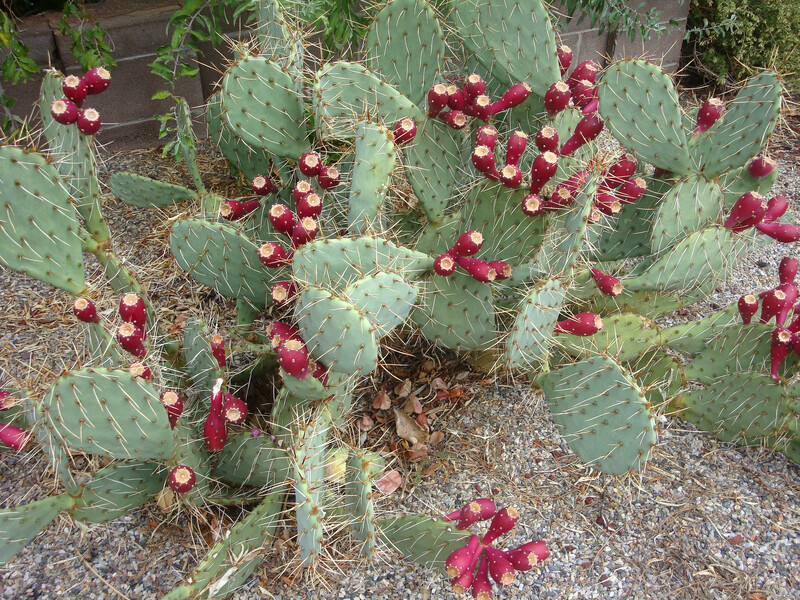 Well, it’s that time of year again, and even though I moved from the Northeast part of Albuquerque in January, to the Southeast part of town, I have a Prickly Pear Cactus in my front yard, although a slightly different variety than the one that gave rise to the Prickly Pear Jelly. Just freeing the “tunas” from the plant is a challenge in itself! As the “tunas” (fruit) started to ripen quickly in the past couple of weeks, I decided to take a different approach this year (I still have a couple of jars of the jelly in my freezer, from last year! ), so I scanned the wonderful “Prickly Pear Cookbook” by Carolyn Niethammer and found a recipe for Prickly Pear Syrup. The syrup can be used in beverages, over ice cream or pancakes, or just about anything you can think of. I’ve stored the unused syrup in my fridge, but you can freeze it as well for longer storage. Put prickly pears in a bowl or dish pan full of water (I used the sink). Holding each one with tongs, scrub with a vegetable brush (I used a toothbrush) to remove dust and some of the stickers (The rest will come out later when you strain the juice). Transfer 6 at a time to a blender jar and process until liquid. Line a mesh strainer with cheesecloth and strain juice into a medium saucepan (here is where I diverged….the liquid was too thick to strain this way, so I improvised the “sock” method (see photos below). You should have about 1 cup (unless you doubled the recipe). In a saucepan with the prickly pear liquid, add the lemon juice and sugar and slowly bring to a simmer. Cook until syrup begins to thicken. Stir with a wire whisk if necessary to a smooth consistency. (the author notes that you can add a tablespoon of cornstarch dissolved in a little cold water if you want it to thicken more, but I didn’t find this necessary). I should point out that after adding the sugar and lemon juice to the liquid and beginning to heat it, it initially was very gelatinous, which surprised me, but after slowly heating to a simmer, that sorted itself out. Later, I read that there is natural pectin in the tunas, which didn’t manifest itself in my previous journey into making jelly. 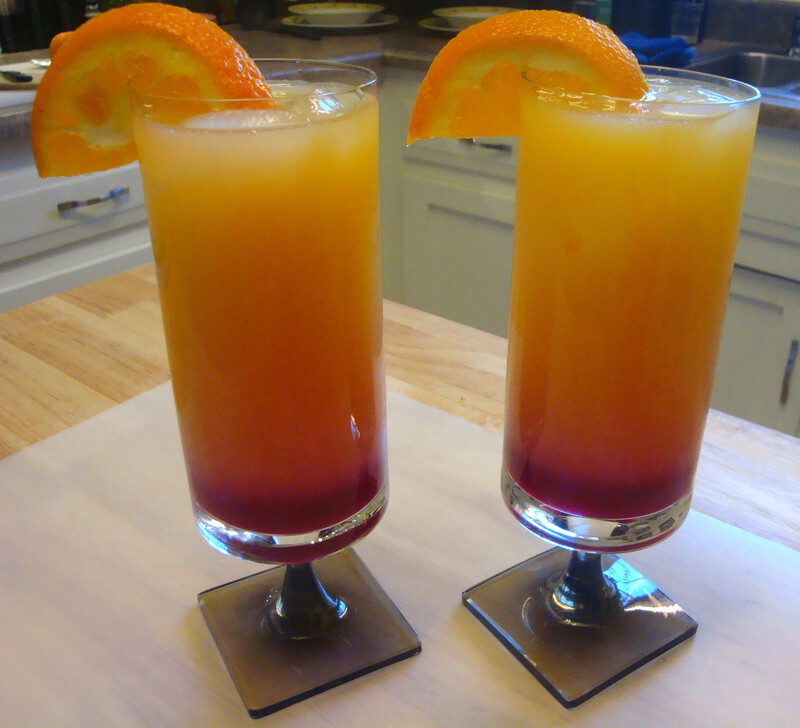 Now, after letting the syrup cool, enjoy an “Arizona Sunset” made with freshly made Prickly Pear Syrup! Fill four tall clear glasses with ice. Fill each three quarters full or orange juice. Divide the liquor among the glasses (about 1 shot glass each, but who’s measuring?). Add about 2 tablespoons prickly pear syrup to each glass. It will sink to the bottom. DO NOT STIR! Garnish each glass with a slice of orange and enjoy! Colourful and thirst quenching, which is what you need after all of this intensive labour! 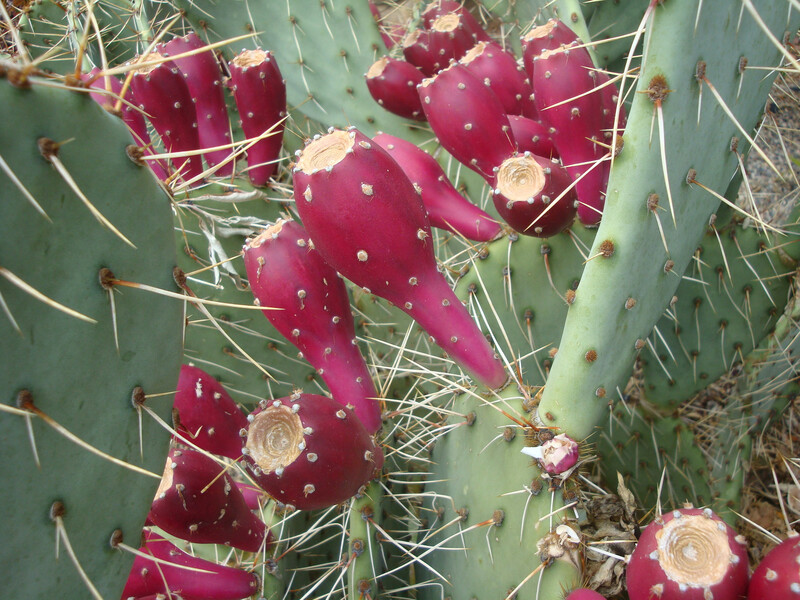 This entry was posted in Cookbooks, Cooking, Desert Fruits, New Mexico, Recipes and tagged Arizona Sunset, Carolyn Niethammer, New Mexico, Prickly Pear Cactus, Prickly Pear Jelly, Prickly Pear Syrup, The Prickly Pear Cookbook, Tunas. Bookmark the permalink. 1 Response to Making Syrup from Tunas? C’mon now! This is exciting. Coincidentally yesterday I was talking about how water kefir grains/ tibicos grow on the pads of opuntia, and was thinking about prickly pear fruit. Does she talk about this in her book?